This is Sprinkles in my Lunchbox’s 100th post! 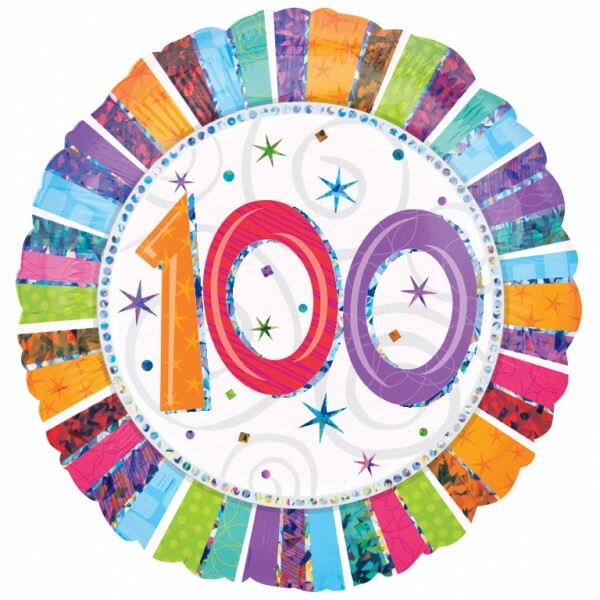 I can’t believe I’ve already hit 100. I guess I had a lot to say! And mostly, I’ve eaten a lot. 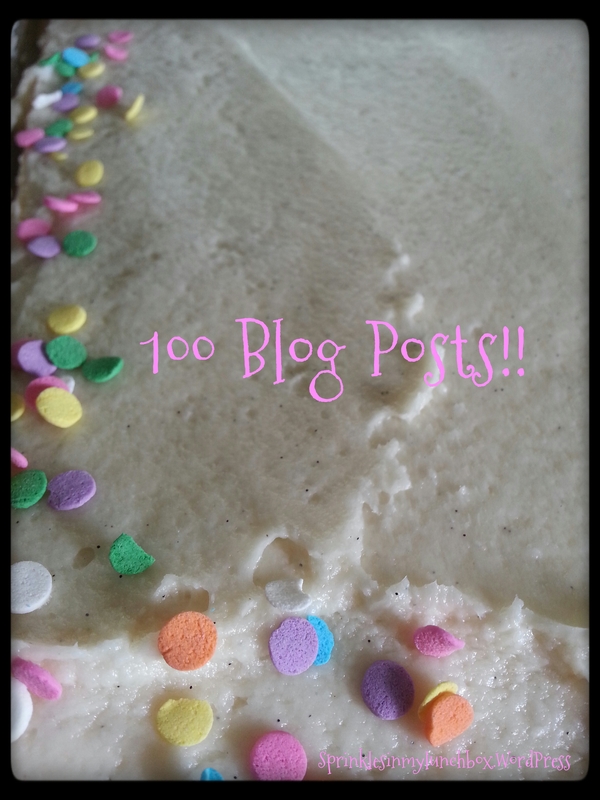 100 posts might not seem like a lot compared to the beautiful blogs I follow, but for this little bloggy blog I started back in October 2013, almost 6 months ago, it’s a big deal. For me, anyways. It’s a dream that I made happen. I am happy I did it. It’s cathartic, it’s fun, and it’s been a great purpose for me. 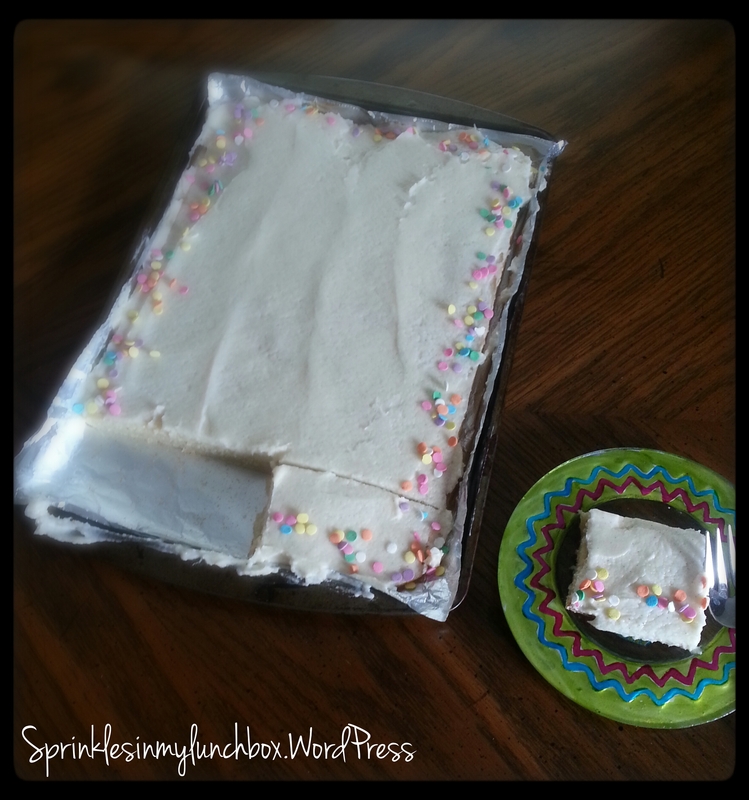 To celebrate, I made a 100th Post Cake. 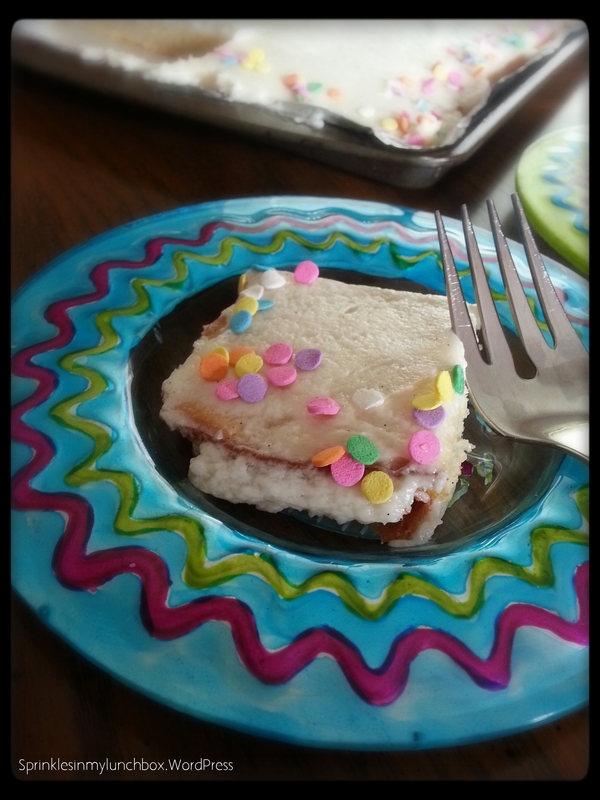 Because…cake. Right away, I knew what recipe I wanted to use for my celebratory cake. 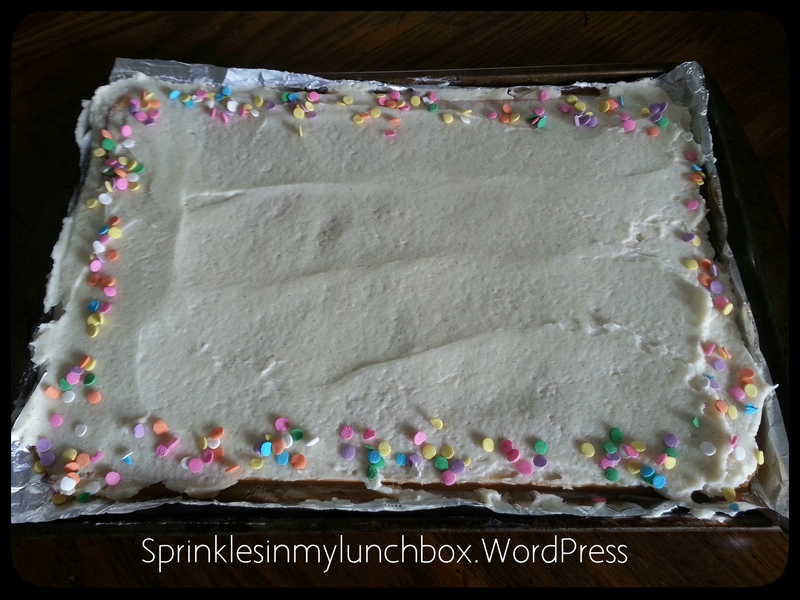 I used Willow Bird Baking’s White Sheet Cake with Fluffy Whipped Icing. I have been following Willow Bird Baking for about five years, and the writer of the blog, Julie, is such an inspiration. When I decided to start this blog, I would refer back to hers for moral support. And she always has such lovely writing, great pictures, and fabulous recipes. There was one post, in particular, where she gave out advice to other food bloggers. I loved her advice. She also had a recipe with that advice. I loved her recipe. I knew I had to make it. So I did. To celebrate. Not that you need, in my humble opinion, a “real” reason to make a cake. Who’s with me? 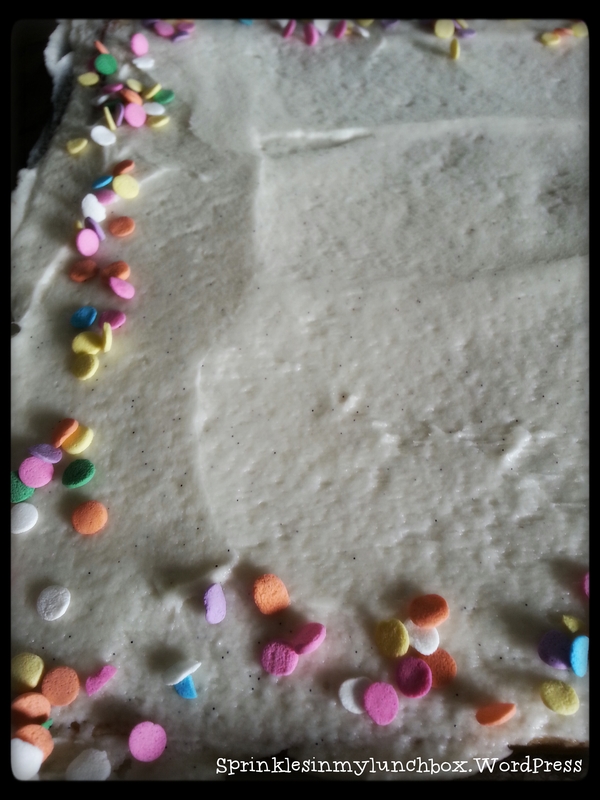 I halved the recipe, since I knew that if I didn’t, I’d eat a whole cake. And as much fun as that sounds, I don’t want to set a bad example to my little boys. And other reasons. Apparently sitting down with a full cake on your lap and a fork in your hand is frowned upon. But whatever. I used a weird sized pan because that’s what I had. It still came out. 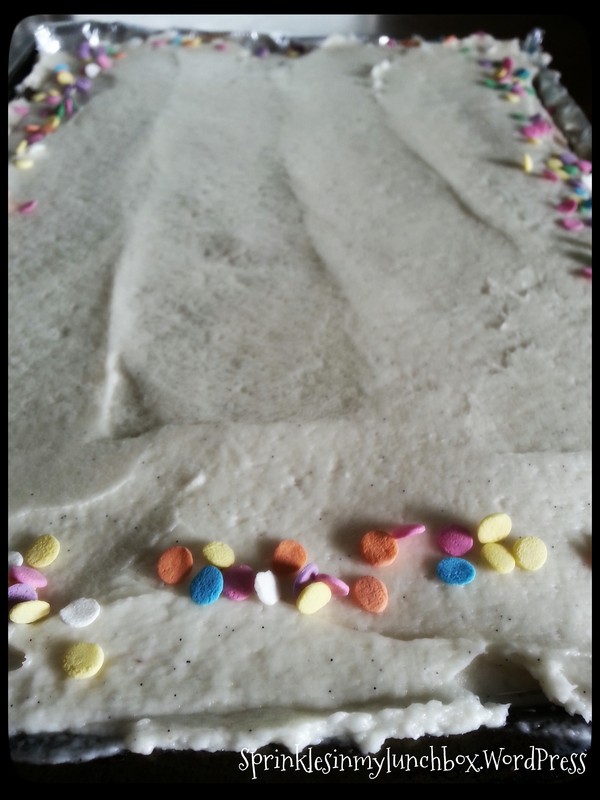 I could have used a 9×9 for a thicker cake, but there is something about a long cake that looks so appealing to me. And it was short and squat too. Sort of like a cake made for a dollhouse. 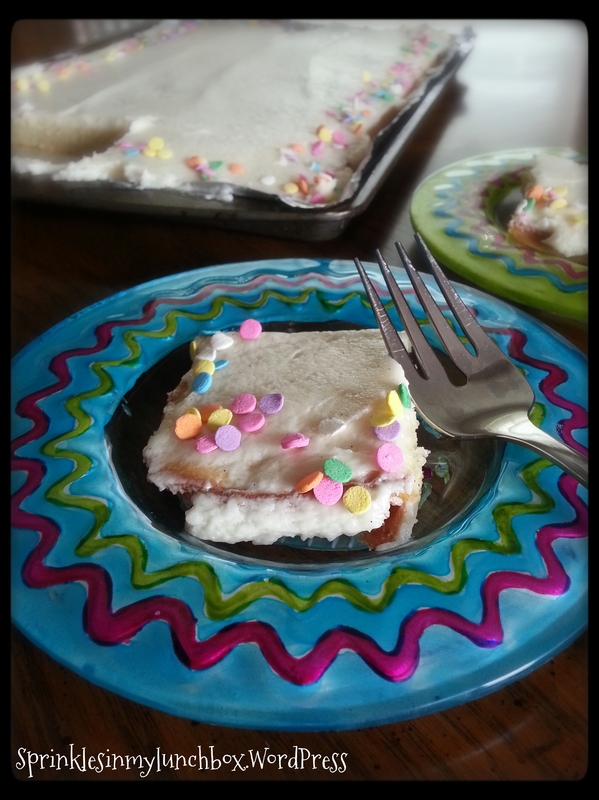 Julie was right – the addition of the almond extract, in both the cake and the frosting, really gave the cake a bakery taste. I love a bakery taste. I love almond cake. So delicate. So bakery. I love the word, “bakery”. It conjures up the most beautiful pictures in my mind. “Cake” does too. Is that weird? 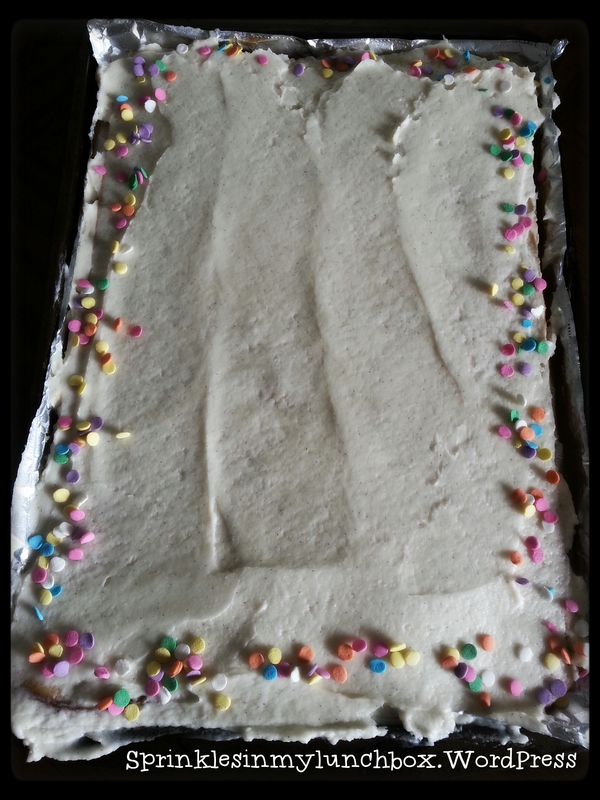 The cake itself was really easy to whip together. Moist, white, almond-cake, covered in a sweet, smooth frosting. Thank you to my family, friends, and followers of this blog. I am so thankful to have an audience that cares what drivel I find myself writing down each time. I am grateful for you. And thank you to Julie, for being a great starting point for me, a mentor of sorts, and an inspirational support. « I can see clearly now, the rain is gone!